The "Dog" nuclear test during Operation Buster-Jangle at the Nevada Test Site on November 1, 1951. 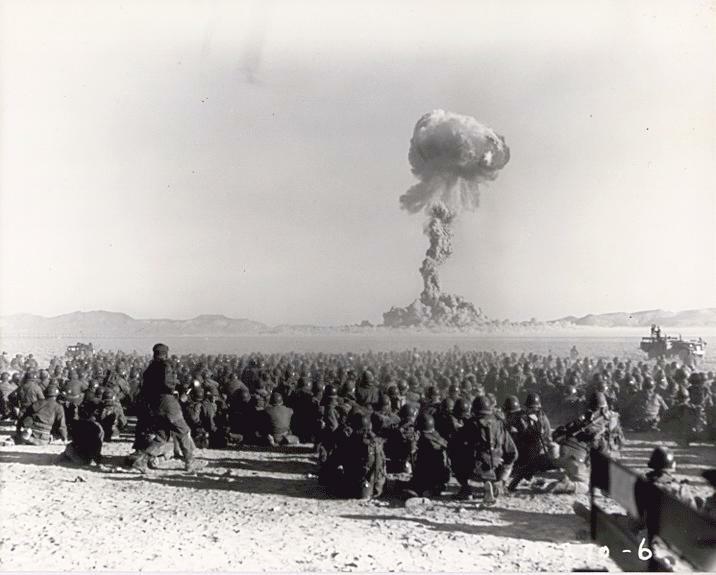 It was the first U.S. nuclear field exercise conducted on land; troops shown are a mere 6 miles from the blast. It remains the most bombed real estate on the planet. The Nevada Test Site — recently renamed the Nevada National Security Site — is 1,360 square miles of sprawling desert north of Las Vegas. A nuclear weapon was detonated there on average every eighteen days from 1951 through 1992. In the 1980s the spiritually-rooted Nevada Desert Experience (NDE) launched a campaign with the audacious goal of ending this practice. For the next decade its effort gained traction, with thousands of people from across the U.S. and around the world converging on the site’s southern gate to protest, pray and engage in nonviolent civil disobedience. Other organizations, including the American Peace Test (APT) and Greenpeace, joined NDE in this struggle. In 1988, three thousand people were arrested in a ten-day action organized by APT at the Nevada Test Site. Against all odds, the Comprehensive Test Ban Treaty (CTBT) was established in 1992. NDE and many other organizations had built a global movement that mobilized people-power on every continent to create the conditions for an end to nuclear testing. One hundred eighty-two nations became signatories. Though Bill Clinton signed the treaty in 1996, the U.S. Senate has yet to ratify it. (Just today Physicians for Social Responsibility called on the Senate to take this up again.) Nevertheless, the United States has maintained a moratorium on full-blown nuclear tests for almost twenty years. While the nuclear threat is as alive as ever, the world is no longer subject to the numbing horror of this dress rehearsal for Armageddon and its environmental, political and moral fallout. NDE just celebrated its 30th anniversary. Since the promulgation of the CTBT, people within the organization have periodically wondered if it should declare victory and close up shop. The answer has been a resounding “No.” NDE has stayed put, with a focus on the nuclear and non-nuclear projects that continue at the test site and the dramatic surge in drone warfare coordination at nearby Creech Air Force Base. At the same time, it continues to vigorously support the Western Shoshone nation in its struggle with the U.S. government, which violated the 1863 Treaty of Ruby Valley by confiscating Western Shoshone and Southern Paiute land to build the site. In addition to a weekly vigil, NDE organizes a “Sacred Peace Walk” from Las Vegas to the test site every spring, and an annual commemoration of the atomic bombings of Hiroshima and Nagasaki in August. 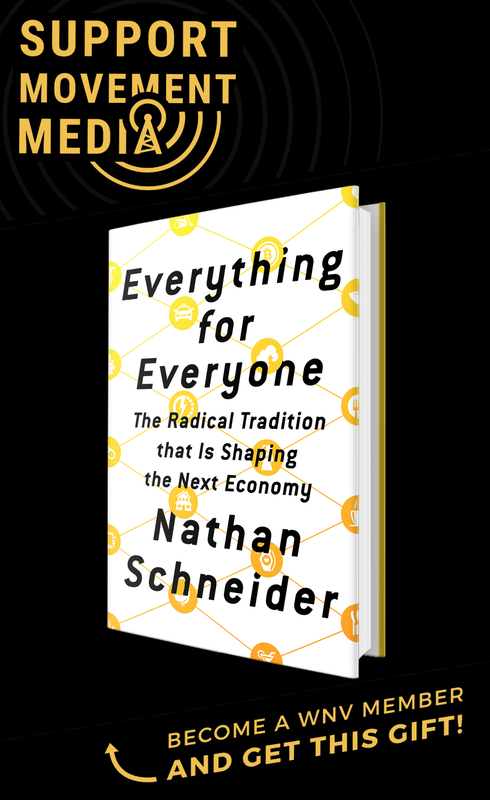 From the vantage point of three decades, there are a couple of lessons that may shed light on the challenges and opportunities of building movements for change today. First, this movement did not begin with a clear strategy. It was founded by a handful of people who ventured into the desert to bear witness to present and potentially future nuclear destruction. Franciscan sisters, brothers and lay people seeking a way to mark the 800th birthday of St. Francis of Assisi followed their hearts to the test site, where for 40 days they maintained a presence during the Christian season of Lent. Their witness culminated in nonviolent civil disobedience as 19 people crossed onto this top-secret nuclear facility and were arrested. This continuity established a growing legitimacy and visibility, which attracted people to this largely invisible site at a time when the emerging anti-nuclear weapons movement, stoked by the Reagan administration’s military buildup, was looking for tangible and concrete focus. Once people woke up to the fact that the government was still exploding nuclear weapons in the western part of the United States — and had not stopped in 1962 when the tests went below ground — people wanted to get involved, and a growing number of them thought about going out to the desert for themselves. What helped translate this longing into making the long drive, boarding a plane or hitchhiking from the nearest interstate on-ramp was the peaceful atmosphere that NDE sought to create from the beginning. Nuclear weapons symbolize and embody mega-violence. What is needed, the founders reasoned, is not more violence but mega-nonviolence. This involved engaging in a Gandhian experiment with truth, which for them meant striking a balance between resistance and openness in their relationship with test site personnel and the local sheriffs. They didn’t think of this strategically — in fact, they thought of this as a spiritual discipline — but in a strange way it turned out to be hyper-strategic. Over months and then years, an insistence on transforming “us versus them” thought and action established relationships at the test site that reduced the likelihood of violent interactions with employees and law enforcement. This, in turn, created a climate that attracted many more people to the campaign than a violent one likely would have. This relatively peaceful atmosphere, created at the edge of a nuclear firing range, emboldened a growing number of people to risk arrest and to face the consequences. This atmosphere was not inevitable. It could have gone very differently, depending on the predilections of either side. The protesters had asked for a meeting with the director of the test site beforehand, which had turned out to be a powerful encounter. And from the very first day they took action at the site, they were scrupulous about maintaining the spirit of nonviolence. At the same time, the head sheriff who dealt with them was fairly new to police work and made it clear, through his words and actions, that he would respect the right of people to protest. NDE had no illusions about the evil that the test site, and the larger nuclear weapons system, represented. At the same time, it held to what the late feminist writer Barbara Deming called the two hands of nonviolence: noncooperation with violence and steadfast regard for the opponent as a human being. For the first year or two, the local county court meted out punishments in the range of a few weeks to several months, but as the numbers increased, the county threw up its hands. It did not have the resources to prosecute and jail an increasingly steady stream of anti-nuclear advocates. It announced that, except under highly unusual circumstances, it would issue citations but not act on them. This opened the floodgates. Soon, large numbers of people were making pilgrimage to the test site and engaging in nonviolent civil disobedience. For some, this meant that risking arrest at NTS had little value. Anne Symens-Bucher, an NDE organizer, saw it differently. For her, NDE actions became a kind of school or training ground for civil disobedience. The peaceful atmosphere that NDE fostered became a place where many people risked arrest for the first time. It prepared them to work for an end to nuclear testing back in their own communities, including taking nonviolent action there. I have become wholly convinced that something is happening at the Test Site which is difficult – if not impossible – to articulate. It is, however, experienced. I have witnessed time and again, people participating in the vigil and going home changed. Something is happening at the Test Site, and it is happening not because we are organizationally efficient, but in spite of the fact that we are not. People of faith and goodwill are being drawn together in the Nevada desert and together they are bringing life and goodness and re-creation to a place of evil, death, and destruction. The location is perfect: the vastness of the desert, the desert in all its stark beauty. It is a beauty which is appreciated slowly, over a period of time … It is conducive to prayer, meditation, soul-searching, purification. It is as if people are able, in the setting of the desert, to reach down into their depths and discover what is good and what is the gift in themselves and in each other. This goodness, this gift, this power, this life-force collectively brought-forth, becomes tangible. Bonds are formed. Community happens. Love is made real. And out of this love, we are able to confront the evil in the desert. Out of this love we are able to heal ourselves, each other and the earth upon which we stand. Because of this love, nuclear weapons testing will end. Thank you Ken, for this cogent historical summary. I have read portions of your book “Pilgrimage…” online, and finally ordered a copy today. I believe you have done an excellent job: not only in giving the relevant history of events and presenting many of the key characters in the NTS struggle, but more importantly by inviting the reader to see the reality of that nonviolent “critical mass” effect which Jim Douglass first evoked. Truly it is in embracing the Mystery of both creation and destruction, that our oft-misguided species can perhaps find an ongoing salvation. Anne Symens-Bucher states it so beautifully. In this kind of work, walked using a minimally-strategic map of the heart, a bright new world is possible.